River Class has enjoyed a fun-filled, exciting December, packed with a variety of holiday activities. Our most recent design and engineering endeavor involved making frames. Students designed their frames on graph paper before measuring and sawing their wood pieces. They learned how to saw safely and efficiently, using a handsaw and wooden block. Their frames evolved into lanterns, picture frames, holiday decorations, and more. We invited parents to come and share their holiday traditions with us. Traditions included holiday stories, traditions around food, holiday crafts, holiday songs and games, and traditions from other countries. We want to take this opportunity to thank those parents for sharing their time and traditions with us. We wish you all a peaceful and relaxing holiday and a Happy New Year! Birds with Mark Hopey Recently, River Class students have enjoyed a number of exciting activities including an afternoon with Mark Hopey, a bird expert who shared lots of fun, exciting facts about birds in North Carolina. We've dissected owl pellets, we've made clay owls, so now it was time to learn some more facts about them and Mark was able to give us lots of good information about owls in NC. Who is making that sound? Recently in art class River and Sky Class students have been learning how to make clay owls as a part of opening up the “Ceramics Center.” Students learned techniques such as using scoring and slip to attach two pieces of clay together. They also learned how to mold clay to make the shape they desired and how to incise designs into the clay. After the clay pieces dried, they were fired in the kiln. Then the students painted the clay pieces with tempera paint and washed the paint away to create a stained look. Many students took the opportunity to mix paint so that they could create their own unique colors to use when painting their owls. This connected back to the lesson they did earlier in the month, using primary colors to make secondary colors. Look for them on display in the Lower School. Halloween celebrations took place yesterday in Lower School and River Class. The children began the holiday fun in the morning with a hayride, which passed by Upper School and a field where horses greeted us. We enjoyed a fun spin around the soccer field! 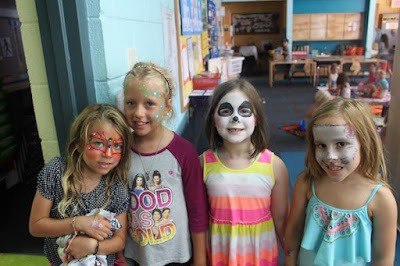 At lunchtime, children changed into costumes and had a fun dressed-up recess. The bell rang and the parade began at 1 pm. Children, parents, and teachers paraded through Middle School followed by Upper School. They were greeted by an eager audience. River students came back to the classroom and were read to by parent volunteers while the teachers prepared for the Halloween play, Are you my Father?/Eres tu mi papa? Following the fun play, the children returned to the classroom for a Halloween party. We would like to say a big "Thank you!" to all our wonderful parent volunteers for making this day possible. S'math is a combination of science and math. Our most recent S'math activity was Hop to the Pond, a game designed to get children thinking about probability. We played two versions of the game. In Hop to the Pond with 6 Frogs, we used a game board with space for 6 frogs, which are numbered 1 through 6. Students working in pairs took turns rolling a die. Whatever number came up, that frog moved a space. When a frog moved 8 spaces, it reached the pond and got to hop in. Then all the frogs went back to the beginning for another game. As a frog won, students reported it by adding an X above the frog’s number on a graph we created on the whiteboard. Design and engineering students have fun navigating the Marshmallow Challenge, created by Peter Skillman. The challenge was to make a free-standing tower which would support one large marshmallow, using a limited supply of spaghetti, tape, and mini marshmallows. Initially, students worked in teams to brainstorm, plan, design, create, and modify their structures. Students then tried the challenge individually. We base our design thinking process on the Engineering is Elementary model developed by the Museum of Science, Boston. We also had fun planting lettuce in groups. First, we raked and pulled out any weeds. Then we dug holes and carefully planted our seedlings. We then watered our garden square. We're looking forward to having a salad bar in a few weeks' time. Studying and dissecting owl pellets is a perfect way to understand the nature of food chains and to demonstrate the role of predators in the ecosystem. River Class students had first-hand experience of the use of dissection tools and techniques and were introduced to a bone chart as a means of identification. We were very excited to use our brand-new stereomicroscopes (bought with River parents' donations last year). These powerful instruments gave the children an opportunity to see their findings in great detail. River Class students have been having fun learning all about snails. River teachers read both non-fiction and fiction books to teach the children snail facts and to show them visuals to help them with their artwork. Students created both snail habitats and snails. River students are learning how to do research by using books, Pebblego.com, and practicing quiet observation. Field Day takes place next Friday, September 1st from 10:30 to noon. We would love volunteers to help with face painting, the balloon launch, refreshments, and more. Today, our first full school day, we've been focusing on snails. 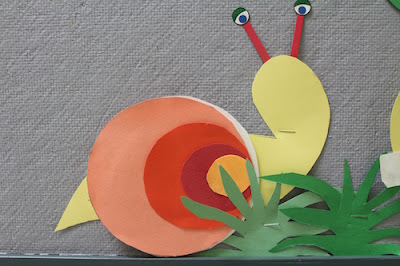 Children have worked on completing their paper snails for our River Class bulletin board. Come check it out! 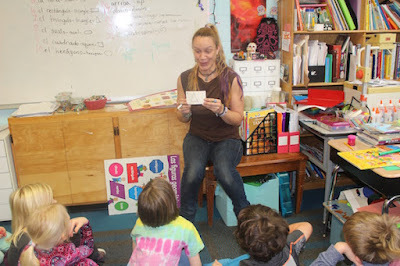 Kathy, our resource teacher, read The Biggest House in the World by Leo Leonni. What a terrific Overday we had this year! What is an Overday? Well, it's a day when we stay at school past the regular end time and have nothing but fun fun fun! We had a great time watching Wall-E in both River and Sky classes, mixing up River and Sky students to make it a little bit different and special. Sleeping bags, pillows, and stuffed animals kept us warm, comfy, and cozy. We had a yummy snack al fresco followed by some River/Sky playtime. We had our Top Chi pizza for dinner (again outside) and then prepared for our talent show. We were amazed by the variety of talent in River Class. Acts included expert jump roping, martial arts, a play, jokes, and basketball comedy. Our evening ended with a campfire, s'mores, and a time of reflection. River Class students recently enjoyed their third and final birthday celebration. This was made possible by all of our parents' contributions of food, time, and expertise. Thank you all so much! The weather also cooperated! It was a fun, beautiful afternoon! River Class recently enjoyed a second visit from Mark Hopey, a bird expert, and director of the nonprofit Southern Appalachian Raptor Research, who previously came to talk to River Class around Thanksgiving with a focus on, you guessed it, the turkey! This time Mark brought with him an African Collared Dove named Gordo for the River children to meet and pet. We learned lots of interesting facts about birds including their cleanliness habits. They are, apparently, very clean animals! Birds also need shelter, food, water, clean air, and a safe place to nest. Dance begins each week with a story that inspires part of the lesson that follows. Children put ideas in the dance mailbox and their enthusiasm shapes the flow of the experiences that follow. This year we did an expansive study of our bodies and shapes that are wide, narrow, curved, twisted, symmetrical and asymmetrical. 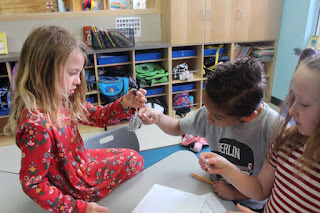 We traveled about the room and figured out how to control our energy in a still shape. The children were excited about shaping together with a partner and creating "shape fences" that progressed around the room as a whole group. Like puzzle pieces that fit together, they delighted in creating designs with their partners. When we started to read the Pilobolus Alphabet book they decided we needed to create letters with our bodies and were fascinated by the idea of embodying a letter shape. Their sense of where they were in space and where they were in relation to the shape of a partner was amazing! River students take turns to plant lettuce seeds. 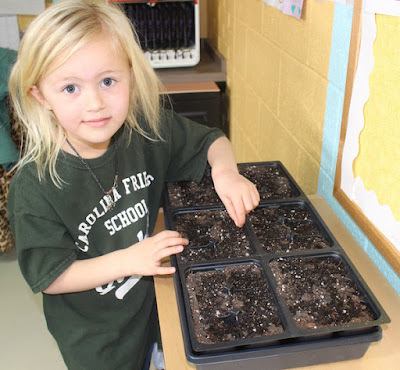 We'll watch them germinate in the classroom. Students will help plant them in our garden square. We'll celebrate with a lovely salad bar in a few weeks' time. River Class celebrated the 100th Day of School on Valentine's Day. We had so much fun! Children shared their 100 collections with each other and participated in a variety of 100th Day and Valentine's Day activities. Please check out the above slideshow for more information. 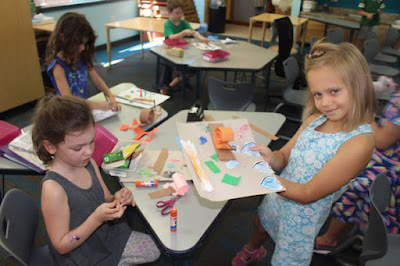 River and Sky students were introduced to the collage center in art class recently. The students learned how to cut out a heart shape on a folded piece of paper and used this as the base paper for their collage. They were asked to pick a theme for their collage and utilize all the materials and tools in the collage center such as paper edger scissors and glue to create the hearts that you see here. We also looked at a collage/painting by the contemporary artist, Kerry James Marshall, and discussed how he used collage in his painting. Can you figure out what the theme is for each heart? What a fabulous, fun-filled day we had on Friday. We celebrated the eve of our 100th Day of School. 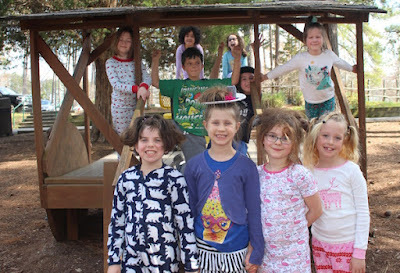 Activities included sharing our collections with one another and Sky Class, art activities, dance, and participation in outside fun; 100th Day collections were wonderfully varied and creative. 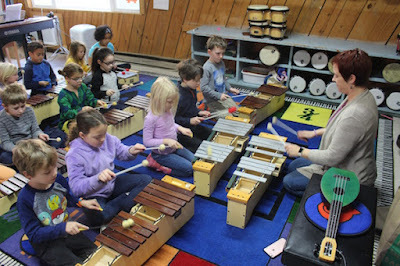 In music class, River students have been exploring rhythm and melody through singing, movement, and instruments. We’ve learned a number of songs that use the pentatonic (5-note) scale that we can accompany with xylophones and rhythm instruments. Students have even been able to figure out how to play the melodies of simple tunes such as “Cobbler, Cobbler” and “Hey, Lolly” all by themselves! We’re challenging ourselves to sing songs while playing different patterns on our instruments or bodies, an important musical skill especially for our budding singer/songwriters. Movement games such as “Head and Shoulders, Baby,” “Jump Jim Joe,” and freeze dance develop rhythm and listening skills through high-energy fun! Finally, we’ve learned several songs that develop vocal skills while expressing our Friends School values, such as “Walk a Mile,” “This Little Light of Mine,” “What a Wonderful World,” “I Will Be Your Friend,” and more. Lower School PE classes have been a whirlwind of excited, engaged, and energetic students. They started the year with Dave doing a variety of activities to encourage movement and cooperation. We continue to work on listening and following directions and being able to safely move through personal and general space. Think chase and evade games involving “tails," dodgeballs, and even hula hoops. 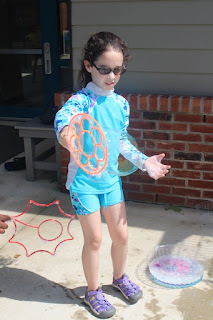 Throwing and catching, changing direction and striking have all been incorporated into individual and group challenges such as filling buckets, racing around objects and relays. Currently, the LS classes are enjoying some parachute activities like “cat and mouse," sharks and lifeguards, the moving turtle, and chute ball. 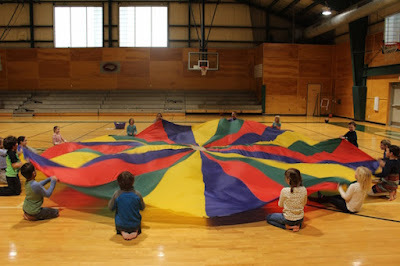 Parachute games are not just fun and hilarious for all ages - they build upper body strength and endurance while improving perceptual, cognitive, motor, and social skills. Coming soon….jump rope classes! 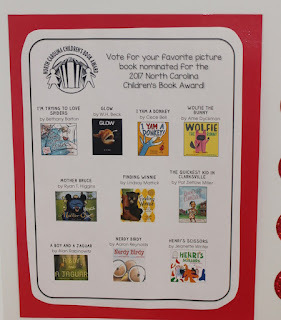 Since we returned from Winter Break, Natalie has been reading the picture books nominated for the North Carolina Children's Book Award to River Class. 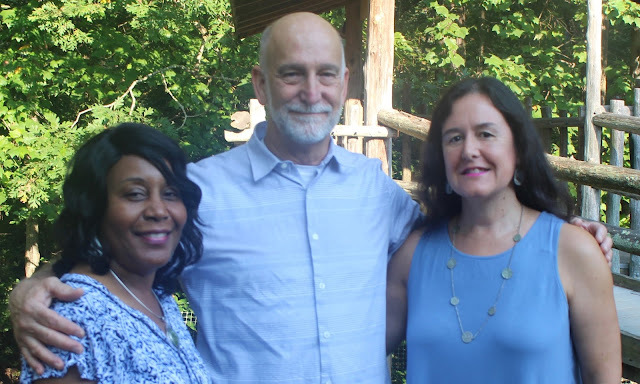 These books were chosen by children all across North Carolina, and students across the state are reading these books in order to select this year's award winner. Next Tuesday, River Class students will participate in the voting process by choosing their favorites! These votes will join thousands of others - the winning book will be revealed in April. You can read more about the book award on the library blog here. 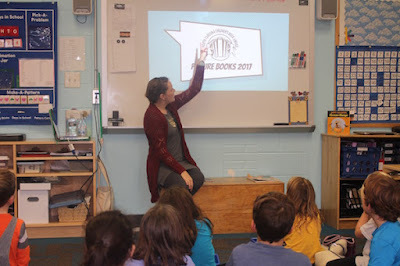 Natalie, our Lower School librarian, came to River Class today to introduce the ten nominated books for the North Carolina Children's Book Award. 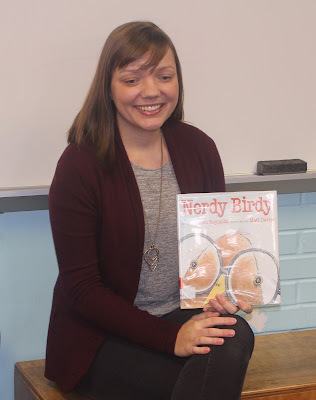 Natalie will be coming to River on Tuesdays and Thursdays to read the 10 picture books, which were chosen as entries last year by students all across North Carolina. River students will also have an opportunity to pick entries for 2018.